Talent Jam - Work it Watauga THIS THURSDAY! A few weeks ago, I had the chance to talk about sales and marketing strategies with several of the companies in Velocity Labs, our startup accelerator. It was a spirited conversation about everything from sales funnels to paid social to content strategy - I love how sales gets everyone fired up! We didn’t get to dig into the content piece as much as I would have liked to, so I asked a local content and storytelling expert, Sanny Visser, to provide some thoughts here. She was kind enough to share 3 principles of good content. A 2016 Smart Insights study revealed that every 60 seconds, over 3 million posts are created, on Facebook alone. There’s no question that the content you publish as a brand is more important than ever. But what are the secrets of good content? How do you make sure that your content adds value, and creates a meaningful relationship with your customer? Let’s reveal three secrets. I clearly remember the very first paper letter I received in the mail (hey, we are talking mid-90s here) from my brand new pen pal. We met on vacation and decided to write letters once we got home. Anxious for that first letter to arrive, I ran to the mailbox every time the mailman stopped. When it finally came, I would open the envelope, take out the letter, read it, and put it back. It would lie casually on my nightstand for weeks, as if receiving letters was just day-to-day business for me. I have kept that letter till this day, just as my parents still have a box of their own love letters up in the attic. Why is it that a written letter can be so valuable? Because somebody apparently cares enough to sit down, take a piece of paper and a pen, and start writing a message to you. A stamp is put on, a mailman comes to pick it up, it travels through a sorting center, another mailman takes it out for delivery and there it is, in your mailbox. A lot of effort goes into one letter. Immediately, the relationship between writer and receiver becomes more valuable. Why am I telling this story? Because in today’s digital world, there’s a way to create this same feeling of value with your customers. How? By offering them quality content, created with care and attention. As a company, you’ve probably heard you need to create content. However, you may not be sure why: how is a blog post – that doesn’t even talk directly about your product - going to give you more sales? It sounds like a bad investment all-round. This couldn’t be further from the truth. Publishing good content will change your relationship with your customer forever. Customers will be more committed, loyal, and involved with your brand. Now, there is no cookie-cutter strategy for content. Every brand is different, so every content strategy is different. There are, however, a few secrets of good content out there. Don’t just repeat what others are saying, but apply thought-leadership. Predict trends, bring new insights, and guide the way. You’ll quickly become an authority in your field. Dig deep and don’t be too broad. To give you an example, compare these two headlines: 5 grill tips everyone should know vs. Foodies: these charcoal tricks will change how you grill this summer. The first one is too broad, the second one triggers food-lovers because it’s about something they might not know yet. It’s not about you or your product. Wait, what? Again: companies that provide good content understand what their customer wants to know. They listen to their needs and don’t just yell to them about their amazing product. So, before you put anything out there, think about what questions your audience might have. How can you truly serve them? Do you want to work on your content strategy? Feel free to contact me over email or over the phone. You can find my contact information here. Sanny Visser helps small businesses share their story and expand their reach through content strategy, social media marketing and storytelling. Sanny’s business is based here in Boone, NC but her Dutch roots run deep. She works with clients near and far, producing content in English and Dutch. Contact Sanny at: 828 719 7464 or on her website here. 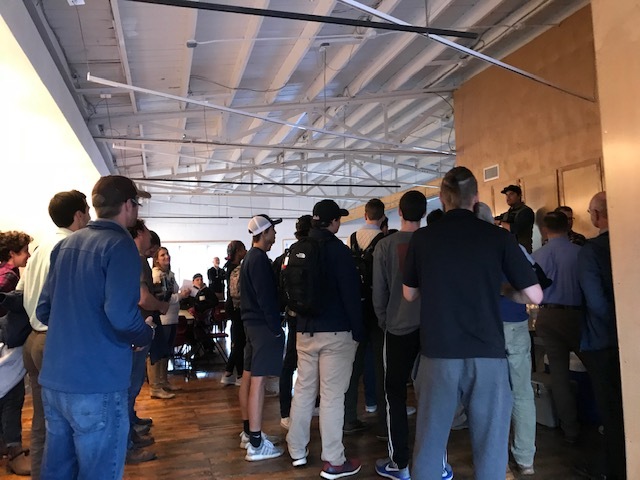 On Thursday, October 18th, 60+ student entrepreneurs, local business owners, aspiring startups, and community members gathered at the HOW Space for the monthly Silicon Hollar Startup Social. 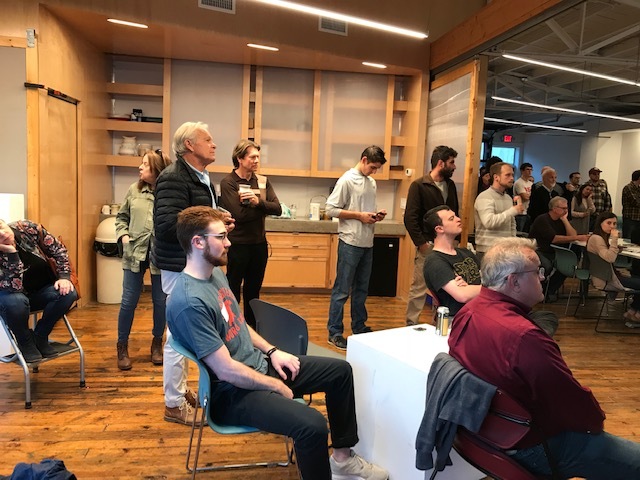 This collaborative networking event brought together three local organizations and their followers; Startup High Country, High Country Local First, and Appalachian State University’s Association of Student Entrepreneurs (ASE). The ASE provided snacks from Carolina Pizza Co. and Appalachia Cookie Co. for all to enjoy. 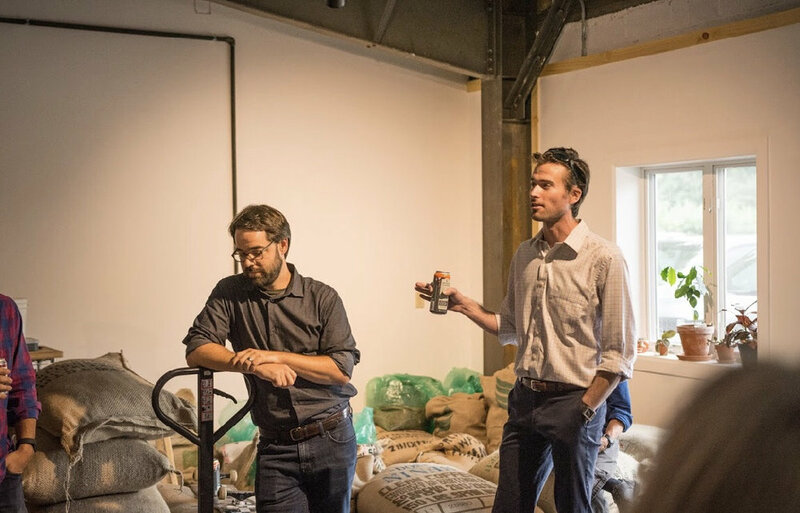 Tim Herdklotz from Booneshine Brewing Co. was in attendance serving local beers along with Jeremy Bollman & team members from Hatchet Coffee serving cold brew and hot coffee! Several Student Entrepreneurs presented their startup businesses to the crowd. Erich Schlenker, from Appstate’s Transportation Insight Center for Entrepreneurship announced the upcoming 15th Annual Carol Moore McLeod Entrepreneur Summit. This event is happening Friday, November 2 on the campus of Appalachian State University. No matter where you are on your entrepreneurial journey, this Summit has something for you. LEARN MORE AND REGISTER. Other pitches were made by members of the Silicon Hollar/Startup High Country Team including Madelyn Hjertmann, Chris Grasinger and Sam Glover. The team announced and unveiled new branding, logo and t-shirt designs for the organization. They also announced that Startup High Country recently received a $100,000 grant from NC IDEA. With this grant funding Startup HC will be able to host the Velocity Labs 12-week Accelerator Course for the next 3 years! John Austin from NC IDEA was in attendance and pitched to the crowd about the recent grant and other great entrepreneurship opportunities through his organization. Angela Heavner from 180 Float Spa pitched her startup company to the room and announced her Local Public Offering. 180 Float Spa is offering you the opportunity to invest in your wellness and our community through a Local Public Offering (LPO). Local Public Offerings became effective in 2017 under the North Carolina PACES Act to help provide access to capital for new and early stage businesses. 180 Float Spa is only the second LPO to be approved for Investment crowdfunding in NC. Investment crowdfunding has been growing significantly around the nation, with over 100 million dollars raised. Now it's our turn North Carolina! Learn more and invest here! 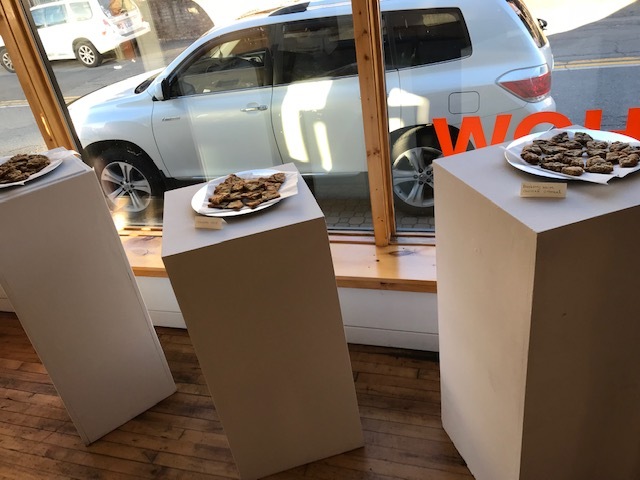 Everyone enjoyed this collaborative event at the HOW Space and many solid connections were made! Special thanks to all those who attended and helped plan this event! Stay tuned for information about our next Startup Social happening in November! Click below to view photos from October’s Startup Social! Where is the capital for startups? As many of us know, successfully launching a business takes an immense amount of energy on the front end. Research and development, building your team, creating a minimum viable product, crafting a marketing strategy – all of these elements take time and hard work. There are an infinite amount of road maps and influencers that are telling you how to reach launch, but sorting through different strategies and advice can push you to capacity as well. All the while you have to keep cash flowing into your household and paying for your own personal bills. You can peak 14 hour days pretty quickly if you are not effectively prioritizing your actions. In many cases, your business will reach a stage where you have to find money to launch or grow the business to a desired point. There are many triggers that can lead to this moment - whether that is finally paying the people doing the work, buying a crucial piece of equipment, or hiring a developer to build the software you need. So where does this capital come from? Sourcing funds from savings of the founders or pulling the needed capital from your own excess cash that the business is generating. This source of capital is just what it sounds like. Sometimes you may receive money from folks within your natural network as a donation or maybe it will come with certain terms. A word of caution is to always be very clear on the expectations of all parties with this type of funding – you don’t want to get to a point of misunderstanding that could taint a relationship with someone close to you. Utilization of a traditional donation based crowdfunding platform like Kickstarter or using one of the new equity-based crowdfunding platforms like Wefunder. Angel investment can come in a number of forms but is typically defined as an individual or group of individuals that make early investments into companies, to fund the startup or early growth stages. An angel investor could actually be someone in your friend or family network. A new angel investment group specifically serving our area is the High Country Impact Fund. This group was formed to invest in entrepreneurs and companies, with high growth and local economic impact potential. These are the traditional lenders that we all know, such as Wells Fargo, First Citizens or BB&T. Many of these banks have excellent services for startup businesses, such as checking and mobile deposit. But they oftentimes lack the ability to fund a startup, due to federal regulations and risk grade. There are a number of different types of lending institutions that are designed to make high risk loans. A localized version of this type of lender is Mountain Bizworks - a community development financial institution, focused on funding Western North Carolina startups and existing businesses. 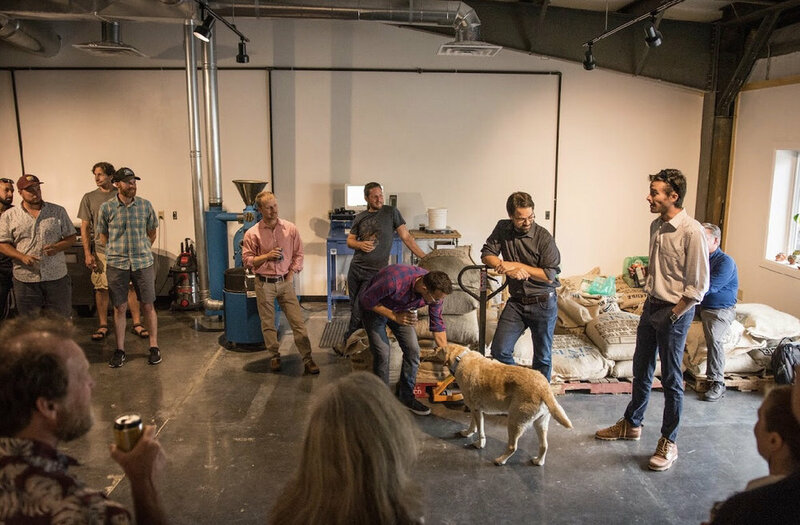 Last Thursday, July 19th, 50+ local entrepreneurs, investors, small business owners, technology professionals, and community members gathered at Hatchet Coffee's new roasting facility on Den Mac Dr. in Boone for the monthly Silicon Hollar Startup Social. 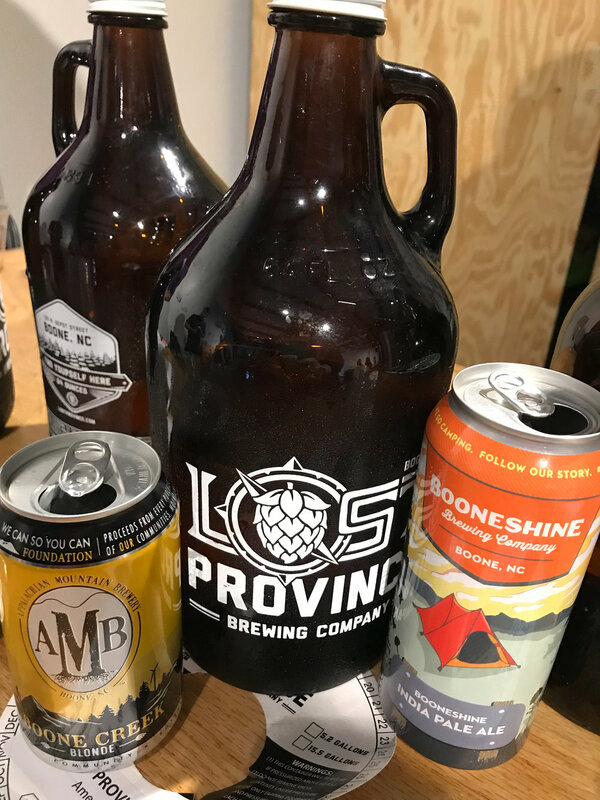 Three local breweries were in attendance and provided beer for the event including, Appalachian Mountain Brewery, Booneshine Brewing Co., and Lost Province Brewing Co. Hatchet Coffee also provided a nice selection of hot coffee and nitro cold brews. When the floor was open to discussion, several pitches were made by those in attendance including, PubCycle of Boone, High Country Radio, 180 Float Spa, Wilderness Yoga, ChurchLEARN, Appalachian Enterprise Center, boonies, Appstate Student Careers, and several others! Jeffrey Scott, team member of Startup High Country, discussed Silicon Hollar's upcoming Velocity Labs, a 3 month startup accelerator for founders & partners of pre-revenue and/or early stage high growth companies focused on accelerated growth of $5-7M in three years. The course will begin on September 4, 2018 and run through November 16, 2018. For more information and to apply please visit, http://www.siliconhollar.org/velocity-labs/. As always, a big thank you to our sponsors, our host, and all of those that attended and contributed to the July Startup Social. We invite you to join us for our August Social at Booneshine Brewing Co.'s new facility on Industrial Dr. in Boone! Stay tuned for the date to be announced soon! Check out these awesome images below courtesy of Gladco Media! 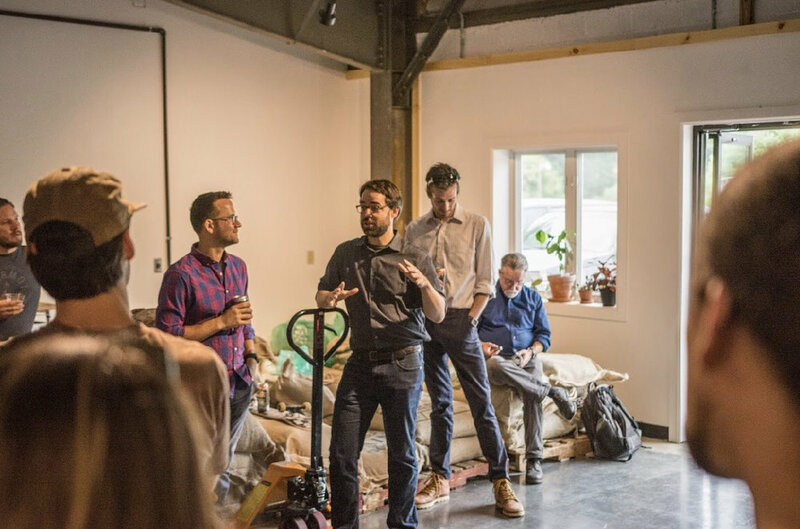 On Thursday, June 21st local business owners, entrepreneurs, technology professionals, investors, and community members gathered at The Greenhouse in downtown Boone for the monthly Startup Social. Beer was provided by Booneshine and Appalachian Mountain Brewery while coffee was provided by Hatchet. 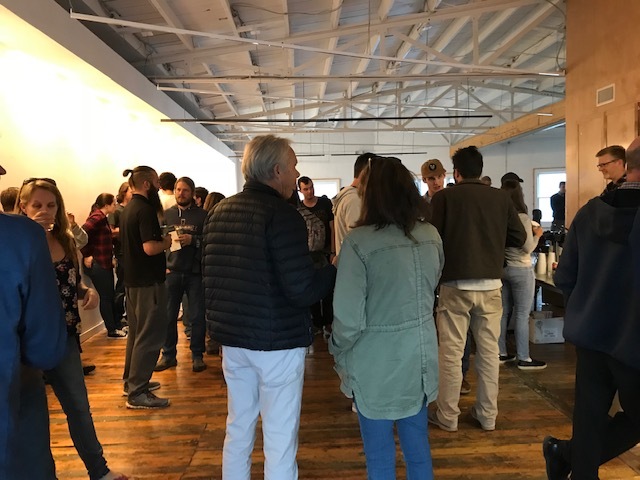 Several representatives from local businesses were in attendance including individuals from Valle Crucis Lavender House, Center 45, Hatchet Coffee, Booneshine, Vixster, and more! Join us THIS THURSDAY for our monthly Startup Social! We will be hanging out at Hatchet's brand new roasting facility on Den Mac Dr. in Boone. Join us for networking, learn what folks in the area are working on and help us build the High Country's Startup Ecosystem! Enjoy beer from Booneshine & Appalachian Mountain Brewery and of course coffee from Hatchet! Special thanks to Mountain Bizworks for sponsoring this month's event! Find our event on Facebook, also be sure to Follow us on social media!